Jul. 2, 2017 1:30 p.m. 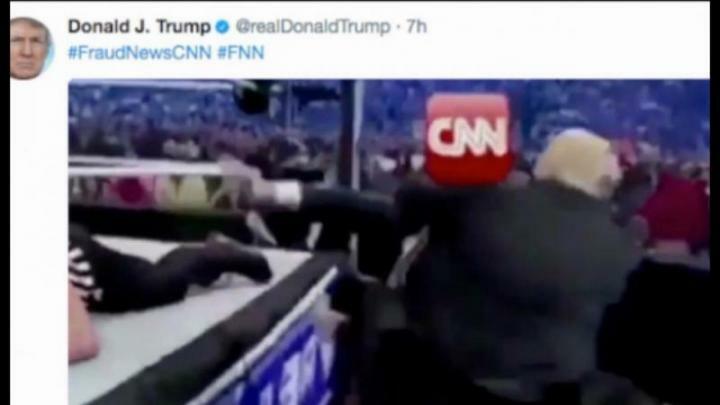 In his latest jab at the media, President Donald Trump on Sunday tweeted a mock video that shows him pummeling a man in a business suit – his face obscured by the CNN logo – outside a wrestling ring. White House officials travelling with Trump during his weekend stay at his New Jersey golf club did not immediately respond to questions about who made the video or about any message the president might have intended to send. The video was posted several days ago by a Reddit user with the title, “Trump takes down fake news.” It was not clear whether that was where it originated or where Trump found it. Still, the user wrote Sunday about being “honoured” Trump had tweeted the video. The user who posted the video has a history of posts using anti-Muslim and anti-immigrant language.